Johnny Moir was born in Scotland i 1915 and moved to Niagara Falls when he was in first grade. At 5-foot-2, he was too short to make the Niagara Falls High School team, but he led Trott Voctional to the Vocational League Championship. Moir gre to be 6-foot-3 forward at Notre Dame where he earned All-America honors for three years. Kentucky coach Adoph Rupp called Moir "the best all-around forward" in the country. 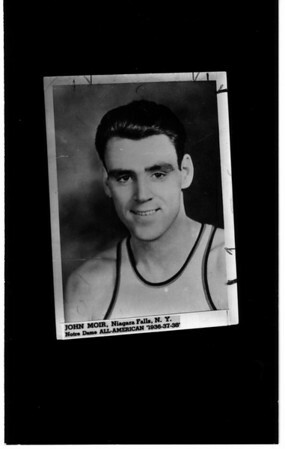 Moir was nominated for Basketball Hall of Fame in 1986. "He was one of the greatest of all college players," said hall of famer Bob Cervi. Photo - Niagara Gazette - 12/26/1986.